Review of Pagan Portal Candle Magic. – Sue's Reviews. Review of Pagan Portal Candle Magic. In the thirty odd years I have been involved in this subject never have I read a book as in-depth as this one. A reader who had no knowledge of this particular subject could buy this book and after reading it have a good understanding of what candle magic is all about. The book is split into four parts and each part has a wealth of information that is clear and concise, beginners and adepts alike will find plenty for them in this book. Part one deals with the correspondences for candles, colour and type etc. Then it deals with everything from scents and oils to ethics and curses, plus everything in between. The author really has covered all bases. There are so many tips, even an old hat like me picked up a few. One in particular that I really liked was to use a wax crayon to roll or dribble over a candle to add colour – what a fantastic tip. The author tells us that it is OK not to have shelves and cupboards full of magical paraphernalia and items for use during spellwork and ritual. Not many authors, I have found, will tell you this, and for me it was a refreshing change. The author encourages us to be inventive when it comes to using items that you don’t have for a spell, using our imagination rather than shelling out for unnecessary items. Part Two of this book covers the basics of ritual. from altars and altar candles, to circle casting, to sending healing. The topic of outdoor candles is covered here, as is candles for seasonal celebrations. Plus, there are plenty of suggestions for candle use during the sabbats. In part three the topic is meditation, divination, and psychic sight. There are plenty of examples of how candles can be used to aid meditation. The author also discusses how candles can be used as a divination tool. There are also plenty of suggestions on how to increase or improve your psychic sight. Part Four covers the history of candles, chandlery – which means candle making – and safety whilst using candles, quite a comprehensive list on this subject. The history of candle making section discusses candles in witchcraft history. At the end of the book, there are plenty of references and a bibliography, well worth checking out too. I found this book to be a comprehensive guide to candle magic and wish it had been around back when I was first learning about such things. The information is just what novices need, with all of the information held in one book rather than several books. I feel this area of the market has been crying out for such a book for quite some time, and now, thanks to Lucya Starza such a book exists. 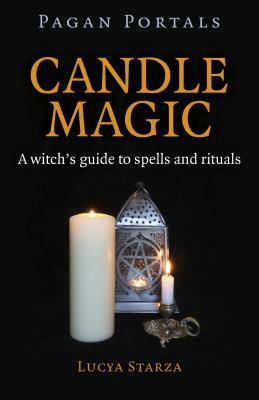 This book is a delight and a must for anyone who has an interest in candle magic. 5 stars ***** HIGHLY RECOMMENDED. Next Post Review of When Everyone Shines But You.